Legendary acoustic guitar driven, singer/songerwriters Margaret Becker & Jennifer Knapp team up for a little Christmas fun! 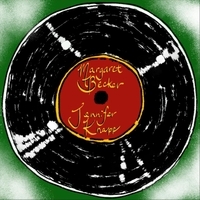 On their own, Margaret Becker & Jennifer Knapp are extraordinary talented artists. Together, they are sublime. In a follow-up to their Christmas classic, they join forces once again for a pair of original 'stocking stuffers' that are sure to get your feet tapping and your hearts singing with cheer!